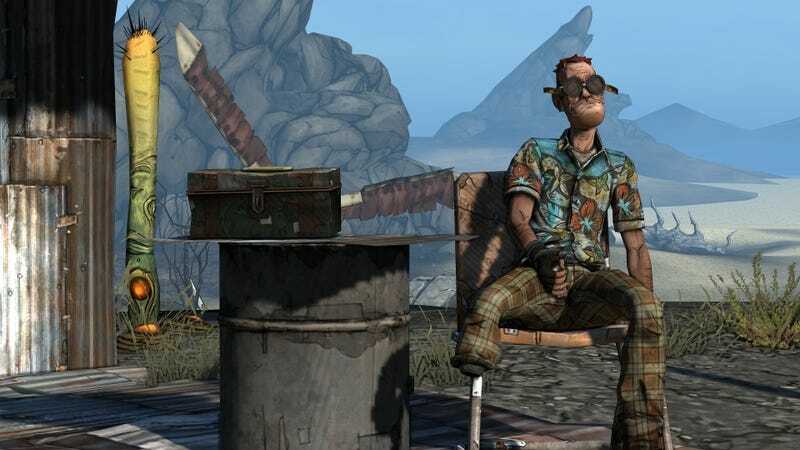 Borderlands 2 will increase its level cap by 11 to 72 and cheerful blind amputee T.K. Baha returns in two more DLC extensions this fall that Gearbox Software announced today at PAX Australia. The level cap raise will occur in the "Ultimate Vault Hunter Upgrade Pack 2: Digistruct Peak Challenge." The challenge refers to a new map and a mode in which you may fight overpowered enemies "for new loot and the ability to 'over level' your game for extra challenges," Gearbox said in a fact sheet. It'll be $5 and it isn't part of the Season Pass DLC. That season is over. T.K. Baha returns in the "Headhunter Pack," which will deliver a new mission set and a boss fight with Jacques O'Lantern, so one would gess this will be out around Halloween. This would appear to be a reprisal of T.K. 's zombie role from the Halloween-themed Zombie Island of Dr. Ned way back in the first Borderlands. Otherwise, I have no idea how they're gonna bring him back, because T.K. met with a rather definitive end (killed by psychos and hanged by his wooden leg) then turned into a zombie. He was last seen eating 100 brains, if I recall correctly. Price on Headhunter has not yet been named and it too won't be part of the Season Pass DLC as, repeat after me, that season is over. In other news from the panel, Gearbox announced its annual community day will be Sept. 14, and it'll be livestreamed. See this URL for more info. Gearbox also discussed its acquisition of the Homeworld franchise from THQ's liquidation, saying it is "committed to bringing the classic Homeworld 1 and 2 games to digital PC stores," and is examining HD remakes for the two as well.